The U.S. is in the midst of a kale craze. In fact, kale is so popular, it's almost a cliche. Before we toss kale into the celebrity gossip category, let's take a moment to appreciate its truly miraculous qualities, from a gardener-chef's perspective. First, kale is one of the easiest crops to grow. It tolerates cold temperatures and survives all winter in my zone 7 garden. Despite record cold and snowfall this winter, kale stood strong. In fact, frost sweetens kale's wrinkly leaves. As I raked the straw mulch off the raised beds yesterday, I found baby kale leaves hiding sheepishly in the soil, begging to be plucked and put to good use. when protected with a layer of straw mulch. 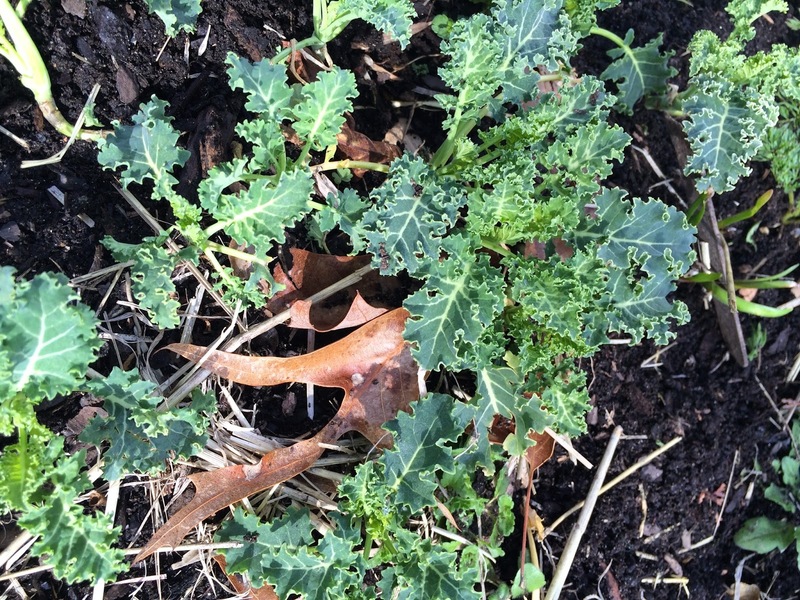 If you didn't plant kale last fall, you can plant some now, before temperatures warm up. Kale grows well in early spring, but bolts as soon as temperatures consistently reach the upper 70's to low 80's. Try several varieties for a colorful and tasty array. I planted "Red Russian," "Dwarf Blue Curled," and "Lacinato," all from Seed Savers Exchange. Kale also grows indoors. Remember the microgreens I started last month? Well, they're now baby greens. I snipped a few to add to the outdoor harvest, rounding out our first spring salad with fresh indoor/outdoor greens. Microgreens become baby greens, when left to grow for several weeks. Unlike store-bought kale, which loses nutritional value, as well as texture, the longer it sits on the shelf, home-grown kale retains its substantial levels of vitamins A, C, calcium, and iron as long as its growing in the ground. Pick it just before using to ensure the freshest, healthiest flavor. Of course, kale can be stored in the refrigerator for up to a week. When grown at home, you don't need to tack on the time the kale spent traveling from to the grocery store and sitting on the shelf, nor do you have to worry about any pesticides. Kale is relatively disease and pest free. Here is some nutritional information for Kale Strata, culled from the USDA Super Tracker Data Base. I love this post! I am trying kale in the garden this year. The Dino kale. I am recent eater of this green..only started last spring and now is time to grow my own. Thanks for a great post! Thank you! There are so many wonderful things you can do with kale. We especially like making kale chips!